This traditional recipe is perfect for a Sunday lunch. Heat a little sunflower oil in a large pan and sear the sirloin on each side. Season with salt and pepper. Remove the beef from the heat and arrange the carrots, onion and garlic on the base of a large, deep roasting tin. Sit the beef on top of the vegetables and drizzle with some sunflower oil. Roast in the oven for 15 to 20 minutes, then reduce the heat to 170oC/gas mark 3. Baste the beef every 10 minutes for 1 hour more (allow 30 minutes per kg of raw meat). Remove from the oven, cover loosely with tin foil and rest for at least 10 to 15 minutes in a warm place before carving. Remove the vegetables from the tin but leave in the cooking juices to make the gravy a little later on. To make the batter for the Yorkshire puddings, sift the flour and salt into a large mixing bowl. Add the eggs and milk and mix until a smooth batter is achieved. When the beef comes out of the oven, increase the temperature to 200oC/gas mark 6. Fill each cup of a 12-cup muffin tray one-third full of sunflower oil and heat in the oven until the oil is very hot and spitting. Carefully remove the tray from the oven and divide the batter between the cups of hot oil. Return to the oven and cook for 20 to 25 minutes, until the batter has become puffed up and golden brown. Meanwhile, to make the mash, place the potatoes in a large saucepan and barely cover with water. Bring to the boil, then reduce to a simmer and cook for 25 minutes, until the potatoes are tender but not falling apart. Drain the potatoes and return to the saucepan over a low heat to dry out, then roughly mash with a potato masher. Add the butter and cream to the potatoes and beat with a wooden spoon until fluffy. Season with salt and pepper. To make the gravy, add the flour to the cooking juices in the beef roasting tin and stir over a direct heat. Whisk in the beef stock and chopped herbs. Boil for 6 to 7 minutes to reduce, then pour into a warmed sauce boat. 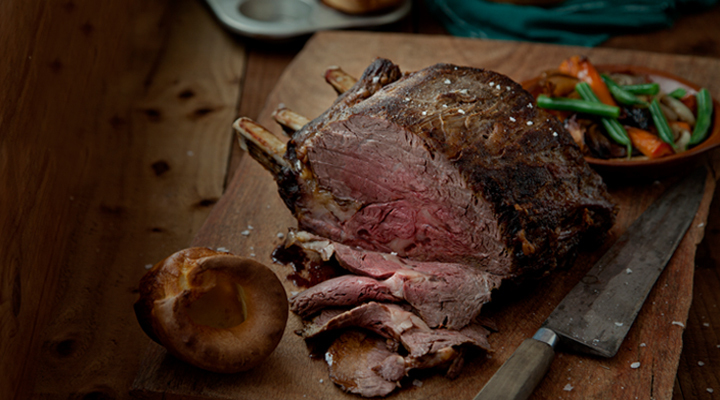 Carve the beef into thin slices and serve with the Yorkshire puddings, creamy mash and gravy.